My friends and I share a lot of cottage traditions. Plaid shirts, late night dance parties, rousing games of Cranium and a game called Boxhead have all become staples of cottage weekends at Duclos Point, Oliphant, or Christie Lake. 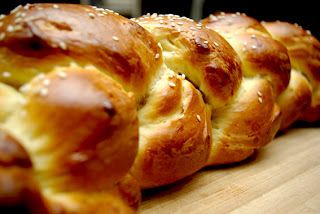 One of my favourites is the challah midnight snack. When everyone has worked up a hunger after a late night dance party, that's my cue to produce a warm, freshly baked challah straight from the oven. My friends and I gather around the loaf and descend upon it like locusts, devouring it in minutes, before retiring to the couch to digest while listening to my brother-in-law Scott play guitar or watch SNL's Best of Will Ferrell. Invariably, all that's left the next morning is a smattering of bread crumbs and an empty butter dish. Unless the neighbours stole it the night before, which has actually happened. This recipe is a hyrbid of a few that I've sampled. I like to use honey but sugar is fine as well, though perhaps use only half a cup or so. I used to make this in my parents bread machine but I've finally developed the forearm strength to make it from scratch. Combine 1/2 cup warm water, yeast and sugar in a measuring cup or bowl and stir until the yeast dissolves. Let stand til foamy, about 10 minutes. In the bowl of a stand-mixer, beat the eggs until blended (use the whisk attachment). Add the butter, salt, and honey and beat until thickened, about 3 minutes. Add the water and yeast mixture and beat until well blended. Exchange the whisk for the dough hook. Gradually add the flour, one up at a time, until the dough begins to form a smooth ball. Continue to beat until the dough becomes elastic, about 5 minutes. If the dough is wet, add a little more flour. Sprinkle the counter or work surface with flour and turn out the dough. Knead for 2 minutes and form into a smooth ball. Place in a lightly oiled bowl and cover with plastic wrap or a damp tea towel. Let rise in a warm area until the dough has doubled in volume, about 1 hour. Punch down the dough and then let it recover and rise for another 30 minutes. Turn out the dough onto the work surface and divide into two equal portions to make two loaves. For a 3-strand braided loaf, divide each portion into three, roll each into a 12-inch rope, and braid them together to form a loaf. I usually braid my challah into a 4-strand loaf, which is a little more complicated. I could type out the directions for this but it's much easier to watch someone do it on Youtube - just Google "4 strand challah". Alternatively, you can form the dough into buns by tying 4-inch lengths into a knots. Preheat oven to 400°F. Once the dough is shaped, let it rise for another 30 minutes. Mix an egg yolk with a couple teaspoons of water and brush on top. Sprinkle with sesame seeds. Bake on an oiled cookie sheet for 10 minutes. Reduce the temperature to 350°F and bake til the bread is golden brown and sounds hollow when tapped on the bottom, about 20 more minutes. Serve warm with butter.